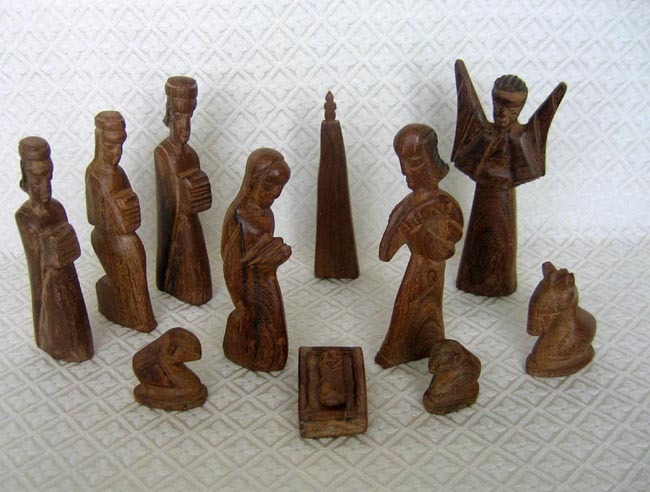 This 11-piece Nativity was hand-carved in Malawi from mahogany wood. This rustic set was purchased in Salima, a small village on the coast of Lake Malawi (part of the Rift Valley) that constitutes most of the eastern boarder of Malawi. Chewa is the predominant tribal group in this area; these people are predominately agricultural. In the larger cities the art shows a heavy Western and Arab influence; however, this set displays tribal influences in the carving style. The angel measures 6.5 inches tall.